Rugel's plantain is a perennial plant that is native to North America. 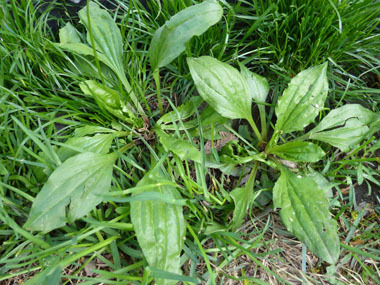 Like its cousin broadleaf plantain, Rugel's plantain can be a persistent lawn weed and flourishes in compacted soils such as in hiking trails and along sidewalks and driveways. It is frequently referenced in many publications as being Plantago major which is an introduced plant to Canada and the U.S. This plantain is in the Plantaginaceae family. Rugel's plantain was named for German-born pharmacist,doctor and farmer Ferdinand Rugel (1806-1879). Distinguishing Features: This plantain grows from a taproot and fibrous root system. It produces a basal rosette of wide oval leaves with longitudinal veining and it is glabrous. 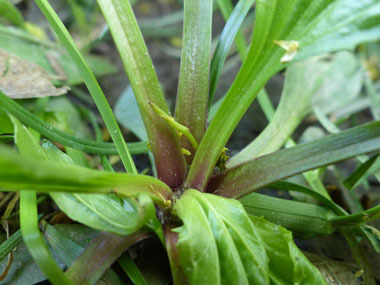 The base of the petiole is typically reddish or purple. 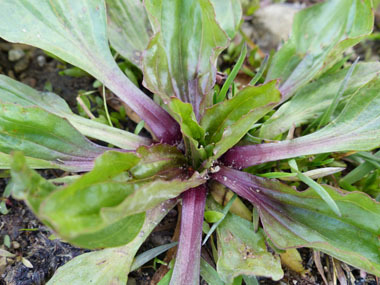 Plantago major is very similar, but it lacks the coloured tinge on the petioles and Rugel's leaves are darker and waxier. Another way to distinguish between the two are the elongated seed capsules (Rugel's) as compared to the nearly egg-shaped capsules of the non-native species. Flowers: Flowers are rather inconspicuous but are densely arranged along a tall, narrow, green spike. The 4 triangular petals are somewhat white and tightly folded back at the tip of the larger oval-elliptic calyx. They have 4 thick, lance-like green sepals and a smaller keel-like bract are at the base. One plant typically has several flowering stems, sprouting up in succession. Flowers June to September. Fields of Nutrition has medicinal benefits and vitamin/mineral content of Rugel's Plantain. Leaves: Leaves form a large basal rosette. Depending on location, some mature leaves can grow up to 35cm (14”) long including the stalk (petiole). The petiole is broadly oval; can be 12 to 18cm (5 to 7”) wide. The thick petiole can be 2cm ( ½ “) in diameter at the base and pigmented a deep purple red. Leaf surface is glabrous, somewhat leathery and hairless; the margins are wavy, toothless or irregularly toothed. There are up to seven conspicuous palmate veins on the lower surface. 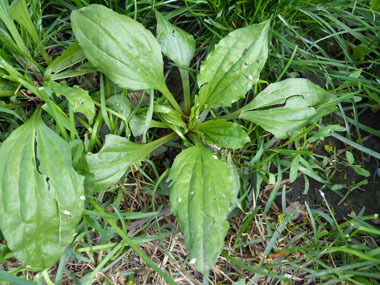 Height: Rugel's plantain grows anywhere from 7 to 30cm (3-12”) tall. 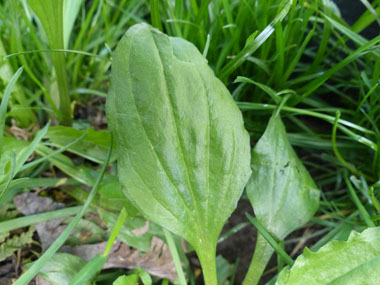 Habitat: Rugel's plantain is found mostly in eastern Canada, and in central to eastern USA (including southeast USA). It prefers part shade/sun locations, moist areas, waste areas and along frequently walked locations. Edible parts: One of the better flavoured plantains, Rugel's is not as stringy as broadleaf plantain, but it is best if harvested earlier in the season because the leaves become more fibrous with age. Young leaves can be chopped and added to a salad. Older leaves can be baked to make plantain chips.